The animation above shows the Magnetospheric Multiscale Satellite (MMS) in orbit around Earth. Note the highly elliptical orbit (yellow) and the Earth’s magnetic field lines (blue). Its launch from Cape Canaveral on March 12 was the origin of that “strange blob in the sky” that prompted last week’s speculation. I thought this video would be a nice way to start. I was contacted by a reader who saw a strange circular cloud appear just west of Jupiter on March 12. 2015 at 21:15 PDT. My first impression, based on the cloud’s location in the sky, and on the observer’s location near Mammoth Lakes, CA, was that she had seen a cloud of ionized gas released from a rocket launched at White Sands Missile Range (WSMR) in New Mexico. These types of experiments also measure properties of Earth’s upper atmosphere and magnetic field. 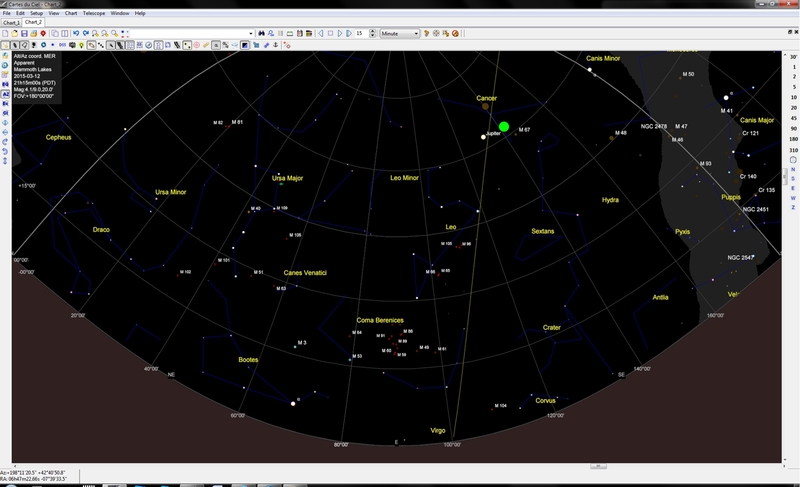 My digital planetarium software, Cartes du Ciel, was able to locate Jupiter as it would have been seen from Mammoth Lakes at that date and time. Click on the thumbnail below. 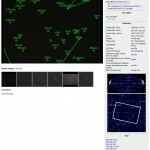 You’ll see that Jupiter was at azimuth 132° and elevation 62°. 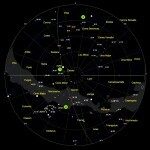 The solid green circle is the approximate location of the strange cloud. 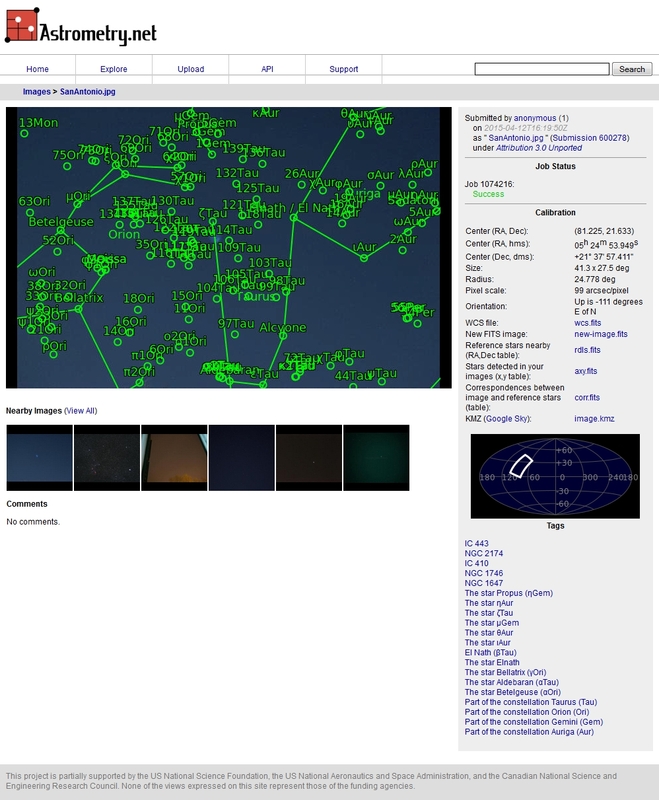 Google Earth told me that, as seen from Mammoth Lakes, WSMR is at azimuth 110° (close enough). Puzzle solved, or so I thought. My inquiry to WSMR’s Public Affairs office regarding any launches on March 12 went unanswered, but many of their launches are classified so their lack of response was not surprising. I figured simple geometry had already provided the answer to the puzzle. Turns out I was wrong. Both articles noted that this strange cloud was the result of a “fuel dump” from an Atlas-Centaur rocket that launched from Cape Canaveral, Florida on March 12. You can read more about that launch here. Any excess fuel remaining after the rocket has done its job is vented into space before it re-enters the atmosphere and falls back to Earth. That’s a standard safety protocol, even though most rockets are destined to splash down in the ocean. Because of the high altitude at which the fuel is vented, it can be illuminated by sunlight even though it’s night on the ground for observers. The differing shapes of the cloud in those two photos can be explained by the combined action of air drag (slight but still present at that altitude) and Earth’s magnetic field. The vented fuel originally formed a nearly spherical cloud of gas, as seen in the San Antonio photo. But that fuel would be quickly ionized by UV and charged particles in the solar wind. Electromagnetic forces act in a direction perpendicular to both the magnetic field and the motion of the ionized particles, spreading them laterally. And air drag would act preferentially on the cloud’s more-dense central volume. The Danville photo was taken about an hour after the San Antonio photo, and by that time the cloud had evolved into a complex plume shape. In that photo, UP = 167° azimuth, so the plume is moving toward the lower left (east). The question remains: Is this what was seen from Mammoth Lakes? With all three observations occurring on the same evening, it seems likely. This cloud was in orbit around Earth, and so would appear at different places in the sky for different observers at different times. I already knew where it appeared as seen from Mammoth Lakes (west of Jupiter), but the San Antonio and Danville photos didn’t include any information about the cloud’s location in the sky. Fortunately, both photos show some stars in the sky near the cloud. 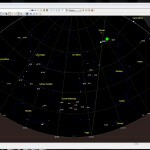 There’s an amazing online utility that allows you to upload an image showing any part of the night sky at: http://nova.astrometry.net/. 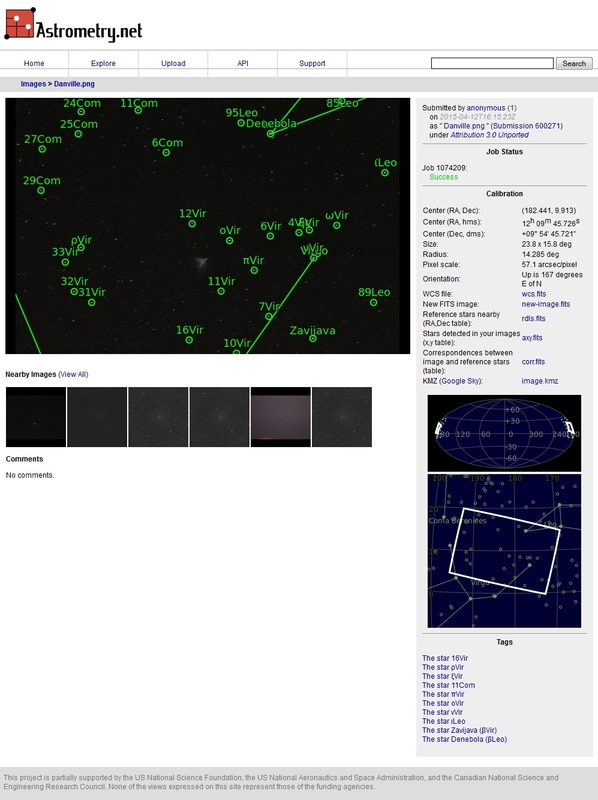 It will then rotate, flip, and scale that image until it matches a group of stars in its database, and return an identification of what’s in the photo. Click on the thumbnails below to see the results for the San Antonio and Danville images. 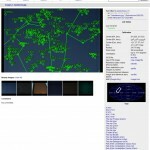 With that information, I could now proceed to plot (on a full sky map) the locations of all three observations. Click on the thumbnail below to see that result. The three observations are marked with solid green circles numbered 1 for Mammoth Lakes, 2 for San Antonio, and 3 for Danville (chronological order for the three observations). Since the rocket was launched toward the east (as most are) to take advantage of Earth’s rotation, that plot might at first seem confusing. One would expect a nice smooth clockwise progression across the dome of the sky. The San Antonio observation seems out of place. But when you consider that it was only about 15 minutes after the Mammoth Lakes sighting, it makes sense. 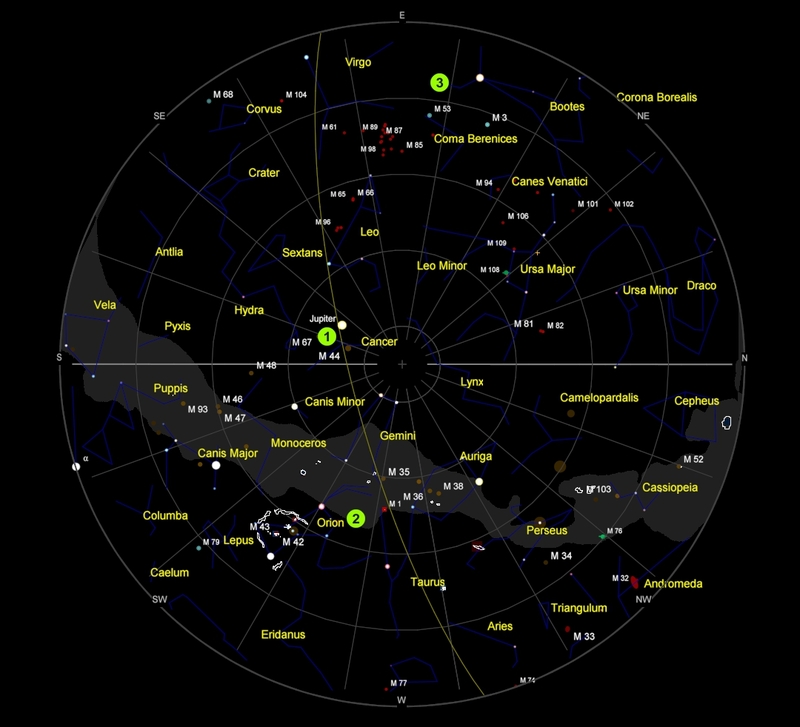 San Antonio is 2100 km southeast of Mammoth Lakes, so what was seen in the southeastern sky from Mammoth Lakes would be seen in the southwestern sky from San Antonio. No worries. Here’s the times for the launch and the three observations, expressed in UTC rather than local times. All locations were on daylight saving time (DST) on March 12, having switched over from standard time on March 8.
where R = semi-major axis, G = universal gravitational constant, and m = mass of Earth. You can look those numbers up and calculate T on your own, but here’s the answer: T= 74,340 s = 2.1 hours. So that matches the observations nicely, including the report from CC (who asked the original question last week) that “the cloud was moving much slower than the ISS.” For comparison, the ISS orbits at around 400 km altitude an has an orbital period of only 1.5 hours. If you’ve ever seen it go over you know how quickly it moves across the sky. If you haven’t, see this post for tips on how and when to spot it. Everything now makes sense. All three observers were seeing the same thing at different times and locations. As I like to say, when you see something in the sky, there’s always a logical explanation for it. But sometimes, as in this case, it takes a little more work to figure it out. I promise next week’s post will be a whole lot easier. Thanks for researching this phenomenon! You’re welcome. It was a tough question to answer, and as you can see, took some research before I was sure about my answer. But I always enjoy a good puzzle, and I’m rarely totally stumped. Not having a photo (from you) to go on made things more difficult, but your excellent reporting of details helped. Thanks for reading Sky Lights!